This year Asus has gone another step ahead with wireless connectivity and they are ready with the latest wireless router model Asus RT-AC68U Dual-band Wireless-AC1900 Gigabit Router. Though it is an upgraded version of the last year model RT-AC66U, this one has appeared with a host of new features packed in a dashing look. Get a glimpse on how it is different from its older version and whether this is what you were waiting for. When we talk about the pace of technology leading our life, we don't really mean necessity, what we look for and participate in, is staying in tune with the latest one with comfort and ease. So it won't be surprising if your existing router is not giving you any trouble but still you are watching out for a better option. And in that case this latest router from Asus would definitely stand in the first few leading ones which you would probably love to have it. As an upgrade to the model RT-AC66U this new router from Asus brings about a fast 800MHz dual-core processor supporting the latest Wi-Fi chip which can raise up to 1.3Gbps speed on 5GHz frequency band and gear up to 600Mbps even on a 2.4GHz band. A new firmware accompanies the package that is a whole new set of awesome features. So you get every bit of excellence that can be expected out of a latest router be it for home or small businesses. The new RT-AC68U model looks entirely different from that of the old design of the previous models like the RT-N66U and RT-AC66U. These models used to fall flat on the surface with a 45 degrees angle on a stand. Now this router stands with an upright position but doesn't carry any option for wall mounting. The build is solid with a glossy dark grayish finish that can ignore fingerprints. It has three external detachable antennas unlike the previous models. The brand new model has ensured a makeover in its mechanism too. You get the new Broadcom BCM4709 Wi-Fi chipset, working with an Arm Cortex A9 dual-core 800MHz CPU, with 256MB of DDR RAM. The RT-AC68U consists two USB ports, one with 3.0.USB support. The Broadcom BCM4709 chipset runs on TurboQAM technology offering a 802.11ac that can go up to 1.3Gbps, and with this TurboQAM, each of the 2.4GHz spatial stream can rise up to 200Mbps than the usual 150Mbps. But to make it work smoothly, you might have to go for a TurboQAM-compatible wireless client. The Interface this time has in its front the usual line of LEDs indicating the status of the ports, while on the back, there are the USB ports, connection to the Internet, and the wireless networks. There is an option of switching these lights off too with a button on the back so that the lights don't disturb you when you need your room to be dark. I liked this bedroom-friendly concept, which was till now a real headache. 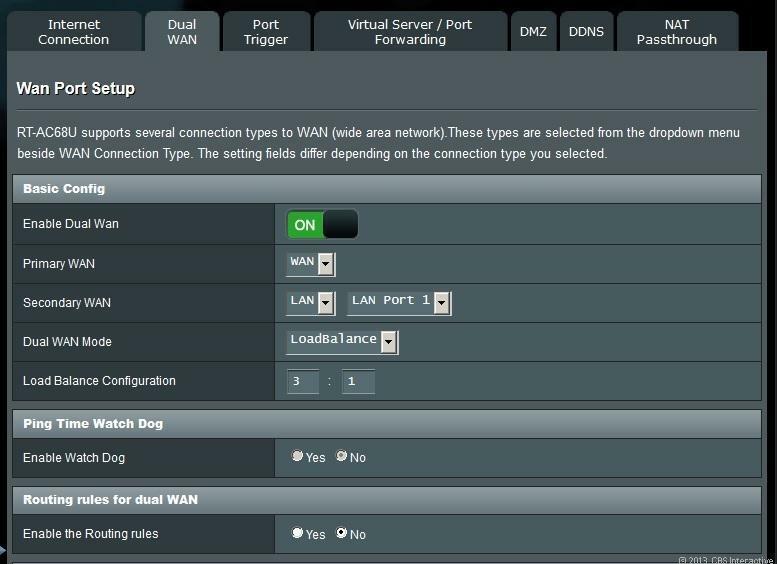 The RT-AC68AU router works as an access point or a media bridge as well, and when you are not using it as a router, you can still use the WAN port as another LAN port. That is really awesome. The router along with a Wi-Fi on-off button also has a Wi-Fi Protected Setup (WPS) button, that starts up a window lasting for 2-minutes wherein other WPS-enabled clients can access the wireless network. It is all by default, and here the WPS function remains disabled but one can turn it on through the Web interface of the rout including the Wireless section. Looking a bit the same as the previous model, RT-AC68U is packed with a CD for the setup software, which is in fact a user manual for the home users. But if you have plugged the router into a computer you need not go through it. The three major parts that are prominent in the interface are the Setup wizard, the General items and the Advanced Settings. The General part offers is all about working with a Network Map to get a glimpse through the currently connected devices, everything which are connected to the router through the USB ports. One can simply click on one of the devices that are connected to start working with it. This feature is a breeze to set up where adding up a device to the existing list of managed devices and selecting the time slots of these devices accessing the Internet is just a matter of few moments. But yes, you are not allowed to customize the restrictions without getting connected to the internet. You are free to use the USB ports for multiple kinds of functions. Connect it as an external storage to the devices or the printers or even better turn the router itself into a storage unit or as a print server. Club these ports with a USB dongle so that you can use the router as a mobile hotspot and also host a USB storage device that are loaded with features like AiDisk, Media server, PC-less download, and AiCloud. Whereas the AiDisk is all about sharing the content of a connected storage device through a FTP server, AiCloud makes it all easy for the users to access the shared and streamed content that are stored on the external drive connected from the OS and the Android mobile devices. This RT-AC68U Dual-band Wireless-AC1900 Gigabit Router from Asus boasts of a powerful package of hardware with faster Wi-Fi technology catering every category of devices you may ask for. The price tag of Asus RT-AC68U till date has not come down and is pretty expensive. The disadvantage of not being a wall-mountable device may add up to the negative list and the faster Wi-fi may not be able to allure every customer where there are other pieces available with similar features at a lower cost. 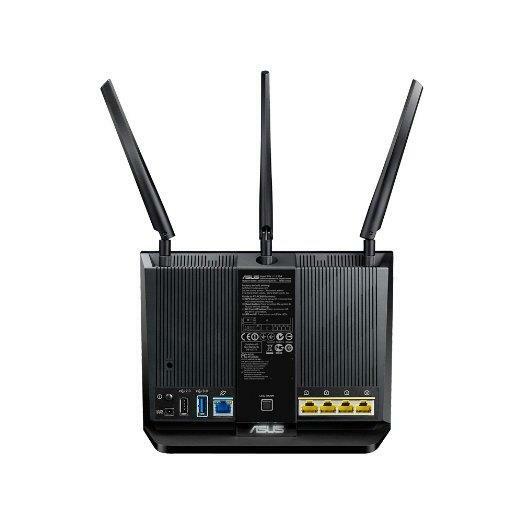 Starting from its built, features and the internet speed it offers, the Asus RT-AC68U Dual-band Wireless-AC1900 Gigabit Router is more of a good purchase for small businesses and there the price would be replenished soon with the kind of functionality it would provide. Thus people who are weighing more for productivity would find it more of an attractive choice. Today in this article I wish to review another great WiFi Router; ASUS EA-N66 N900 Dual-Band WiFi Router. This device features many interesting things that you would love to have in your router. Continue to read on this article and find the interesting features, specifications and price of this device. In this article I am going to review ASUS USB-N66 Wireless N900 Gigabit Dual-Band Wireless Adapter. This is a similar version to that of ASUS EA-N66 3-in-1 Adapter. A review of Asus RT-N16 Wi-Fi Router. Also read the specifications and features of this router. In this article I'm taking you through a review of a wifi router named Asus WL-330N3G. It has the specialty of the being the smallest wireless router supporting 6 modes/ functions.